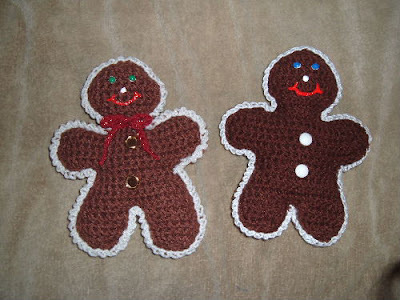 I made these gingerbread ornaments for my two sons. They absolutely loved them. They didn't want to pack them away this year they loved them so much! You have to have a basic knowledge of how to crochet in order to make these ornaments. The pattern uses the basic steps of chain, single crochet and double crochet. I added a single crochet border to mine and embellished it a little different than these. I also stuffed mine before fastening off to make him a little fatter. My hanging loop is on the back on the head so it can't be seen in the picture. They really came together fast and were simple to do. Gingerbread men always make me smile. Hope they will for your family too! Copyright © 2008 by Melissa Langley. All rights reserved.